Consumerist reader Anne and her husband just welcomed a new baby girl to their Brooklyn home, and as such, were busy getting ready for her arrival in the weeks leading up to her birth. As part of her nesting activities, Anne ordered a baby rocker from Target and chose a light cream color. But when it arrived, it was really more of a brown hue and she didn’t want to keep it. She writes that whether or not the color mix-up was just due to her personal opinion of the product when she saw it or Target biffed and sent her the wrong item, she wanted to return it. But Target wasn’t about to make it easy for her to do so. “When we called to return the chair the only way to return it was to take it to a store or pay to ship it back. Living in NYC with no car this was a really difficult option, but I guess what had to do what we had to do,” Anne explains. So Anne’s husband and her brother rented a Zip car and brought the chair back to the closet Target store in the area. She says her husband filled out the required paperwork and went through the return process, and was assured that he’d see the refunded money on their American Express statement. Fast forward to a few weeks later, when Anne says the charge was still on their Amex, and she called to find out how that could possibly be. Surprise! Essentially, “We lost it, that’s your problem and oh yeah, shrug!” Anne wasn’t down with this outcome, after all, was she supposed to go root around in Target’s warehouse and find the dang thing herself? Nuh uh. 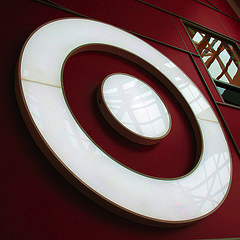 After informing the Target rep that it was downright silly that she should be held accountable for a chair that had been handed over to a Target employee, Anne says the customer service rep came up with the only solution that would result in getting their money back: Dispute the charge with Amex and Target just wouldn’t fight it. Anne was amazed that that was all Target could do — and notes she’s lucky that Amex is good about such chargebacks. Her money was refunded and she found another chair in the right color, but says she still finds it totally mind-boggling that Target would claim she was responsible for an item they misplaced after it was returned successfully. Unless Target wants a legion of customers rooting around in their warehouses to find lost items, our minds are boggled too.